The Thermo Revco Pharmacy Refrigerator provides you with high capacity, digitally controlled cooled storage, with at a glance monitoring. 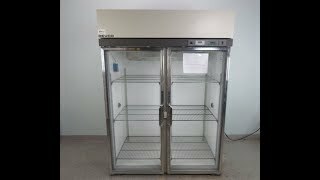 This double door lab refrigerator features two, lockable, double paned glass doors that allow for full viewing, and eliminate condensation, and when its time to load the refrigerator, the doors stay open easily at 90°. This Thermo refrigerator features excellent uniformity with high density foamed in place insulation to guard against ambient temperature fluctuations, an extra-strength hermetically sealed compressor system, automatic defrost, and a directional airflow for fast recovery after door openings. This lab refrigerator is 51.5 cu ft in volume and has a temperature range of between 1° to 8°C, that’s adjusted in 0.1°C increments, from the microprocessor control panel with graphic display to show overall operational health. The Thermo Revco RPR5004A interior is brightly lit with environmentally friendly LED lights, adjustable shelving and features 1” insulated access ports on either side. To protect samples this upright lab refrigerator has various safety systems including alarms for deviation from temperature set points, remote alarm contacts, and batter back up to keep the control panel active during a power failure. This Thermo Revco Pharmacy Refrigerator CAT# RPR5004A20 has been fully inspected and is operating without issue. Please note there is cosmetic damage at the base, pictured. All of our lab equipment comes backed with our standard warranty. Should you have any questions, please don't hesitate to contact us.